The Ironbridge Gorge has a long industrial and mining heritage leading to its designation as a World Heritage Site. However these historical activities have made sections of the Gorge susceptible to landslips and subsidence. 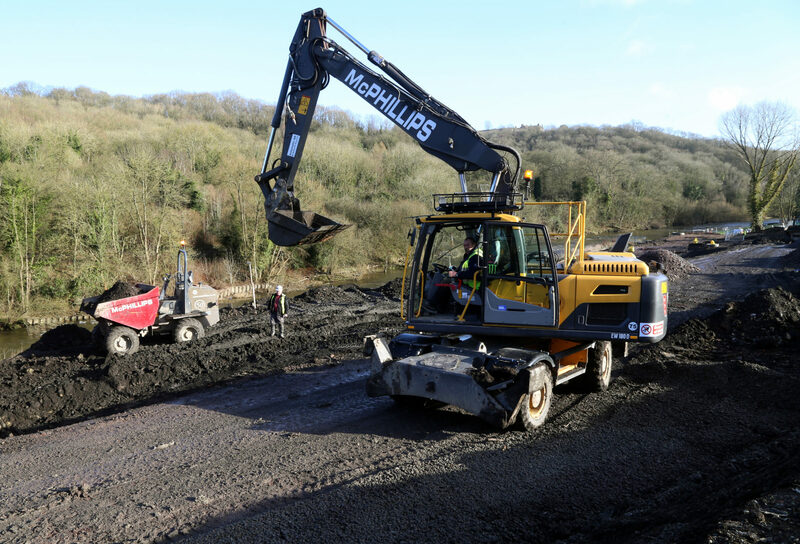 McPhillips was contracted by Telford & Wrekin Council to undertake ground stabilisation works to a 400,000m2 section of the southern flank at Jackfield, both to provide long-term stability for the road running alongside the River Severn and to prevent a landslide blocking the river channel which would cause significant flooding upstream. Installation of over two thousand 600mm diameter piles, reinforced with 450mm diameter steel tubes up to 13m long. Installation of over five hundred 250mm diameter concrete piles reinforced with 139mm steel tubes, again up to 13m long. Installation of over five hundred rotary displacement concrete piles up to 9m long. 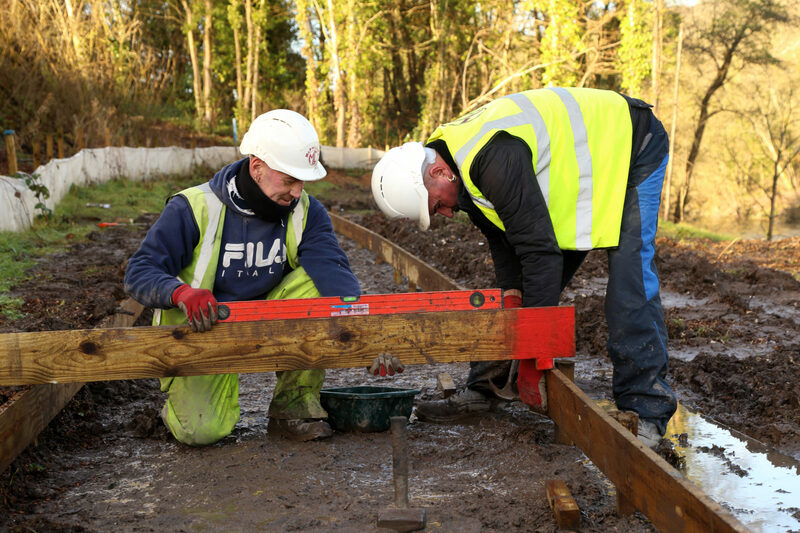 Construction of swales, ditches, ponds, pipes and associated structures in order to drain the area effectively – groundwater being a major contributor to landslides. Construction of a stone revetment in the river bank along the entire frontage of the landslip zone. Diversion of a number of existing utility assets, including a 300mm diameter foul water pumping main. Reconstruction of the road alongside the river to a new alignment, with associated architectural lighting and fencing. Re-profiling the whole hillside to create an aesthetically pleasing landscape. 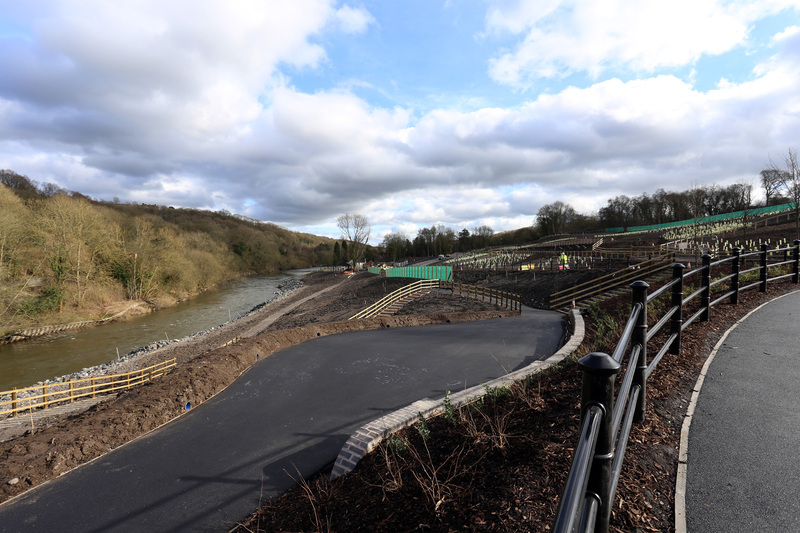 Formation of footpaths, steps and seating areas around the lower hillside for recreational use. Seeding and planting shrubs to the landscaped areas. 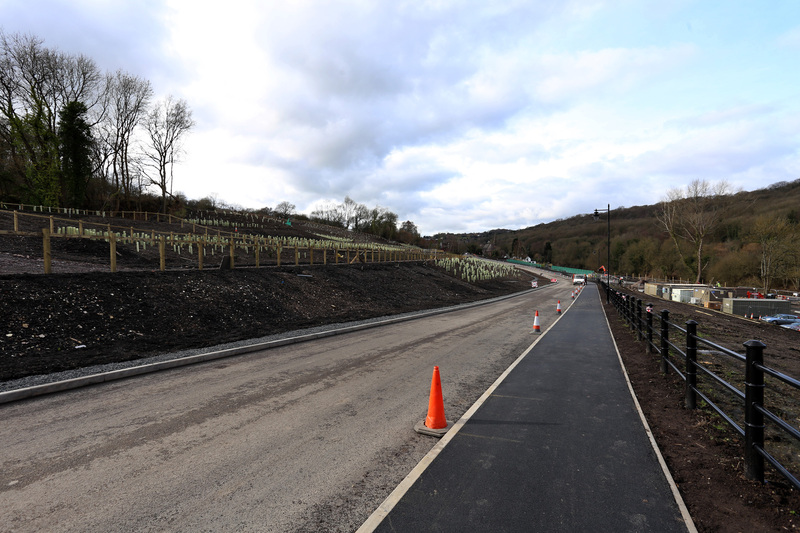 McPhillips engaged the services of a geotechnical engineer to design the temporary works and advise on the construction methodology in order to reduce the risk of further land movement and to prevent triggering a catastrophic landslip. This process was on-going throughout the project and included McPhillips monitoring ground movement, groundwater levels and river levels daily. As well as the geotechnical challenges, McPhillips also had to contend with a range of environmental and ecological issues, including developing mitigation strategies with respect to bats, fish, reptiles and other protected species. 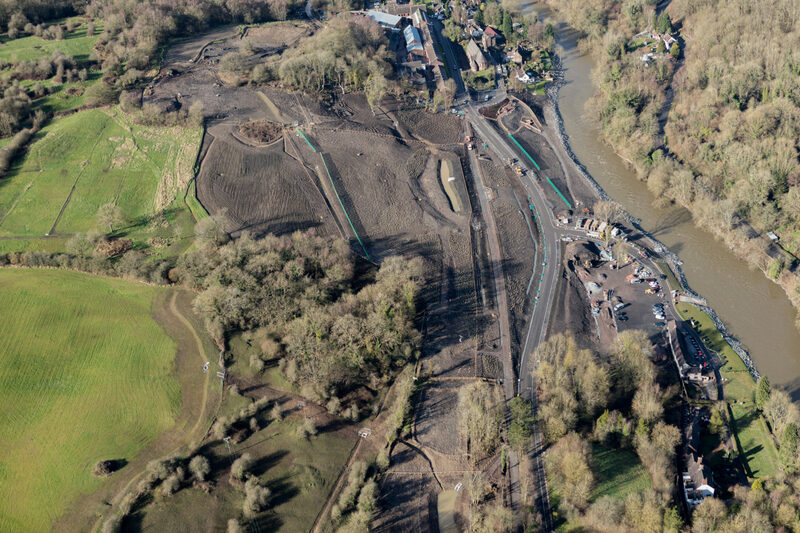 For this purpose we engaged the services of an consultant ecological clerk of works whom was responsible for advising on mitigation methods and for carrying out weekly inspections to ensure that activities impacted minimally on the environment. McPhillips’ management team actively engaged with local residents and organised site visits for them and other interested groups including the local Round Table. In addition the contracts manager gave presentations to the volunteers at the Ironbridge Gorge Museum Trust, and participated in drop-in sessions hosted by Telford & Wrekin Council.